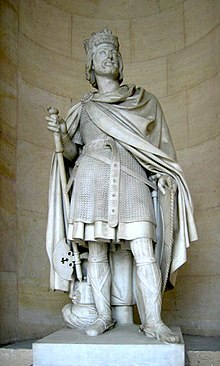 Charles Martel (c. 688 – 22 October 741) wis a Frankis statesman an militar leader who, as Duke an Prince o the Franks an Mayor o the Palace, wis de facto ruler o Francia frae 718 till his daith. ↑ Schulman, Jana K. (2002). The Rise of the Medieval World, 500–1300: A Biographical Dictionary. Greenwood Publishing Group. p. 101. ISBN 0-313-30817-9. This page wis last eeditit on 25 Mairch 2017, at 16:32.